the SULTAN like in the real world, is a ceremonial figure yet a destructive force and a great ruler; hand made in Nepal..
Another prolific addition to KHHI nepal's product line up from the amazing 'Chirra' family, “Royal 7 Chirra (Sultan)” amongst its counterparts is the latest and better version due to the fact that it is the most difficult to make comparatively to other chirras in the family, and one very valuable heavyduty-highclass productive khukuri knife. 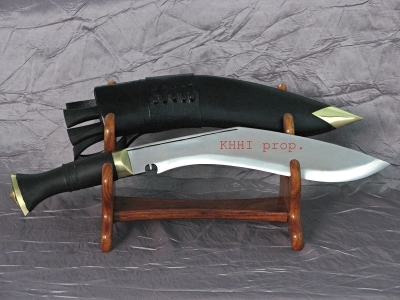 Series of chirra/fuller, 7 to be exact is the key, powerful and celebrated aspect of the kukri. This exceptional feature is thus addressed by naming it in a grand way as the “Royal 7 Chirra (Sultan)”. This full 15” bladed super strong and creative knife is an aggressive one best suited for critical times and situations yet is tranquil who’s beauty and elegance can be thoroughly enjoyed all day long when displayed on a shelf. 'Sultan' like in the real world, is a ceremonial figure yet a destructive force and a great ruler. CHIRRA : 7 in total, highest that is offered. 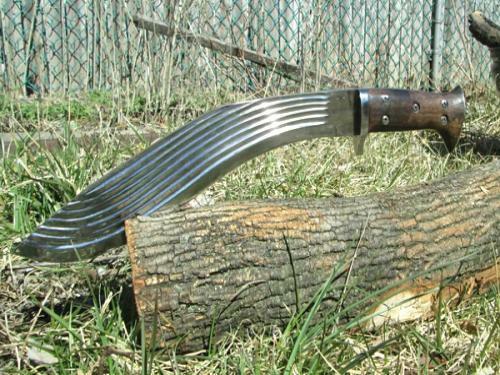 Hand forged Chirra/Fuller for strength, durability and beauty. Only highly skilled craftsmen can do it. Chirra will reduce tension/pressure generated in the edge when striking by gradually distributing the force in a wavy pattern from edge slowly towards the spine. This will minimize the pressure/stress felt by the edge and the whole body and as a result the blade will not rattle even in extreme strokes. This will give longevity to the blade. 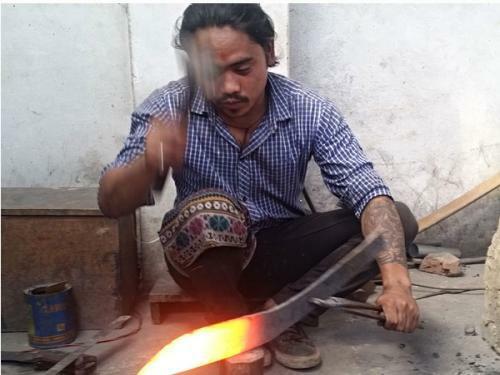 The chirra will also reduce the mass of the blade making it light and thus very easy and effective to use, HANDY. Chirra also adds beauty and class to the knife. 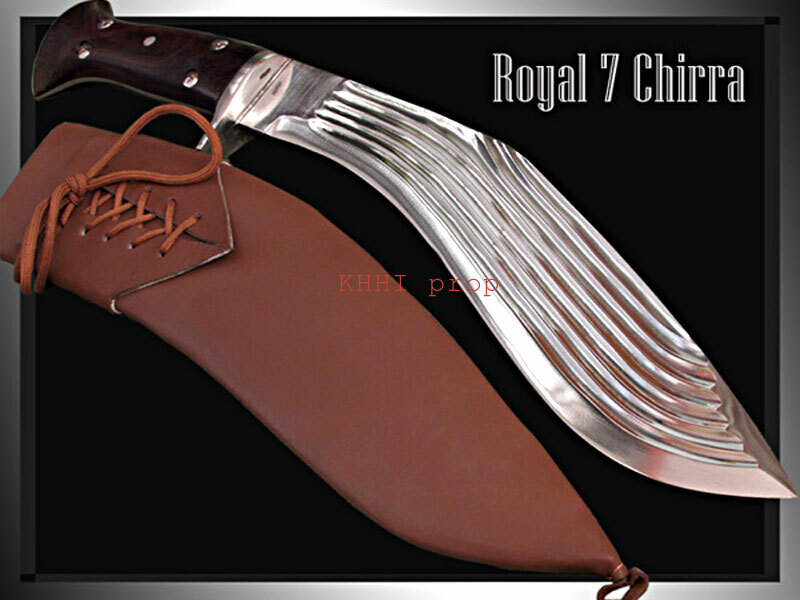 Royal 7 Chirra’s chirra is forged and grinded narrower and deeper than other Chirra-wals in order to control width and weight of the blade. Steep chirras are done to fit in as less room as possible. 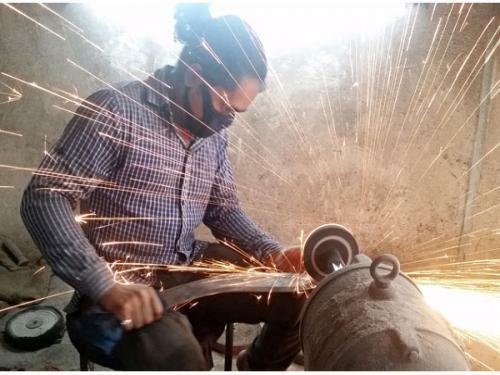 Here preparing the chirra (grinding) wheel is critical and requires good skill. 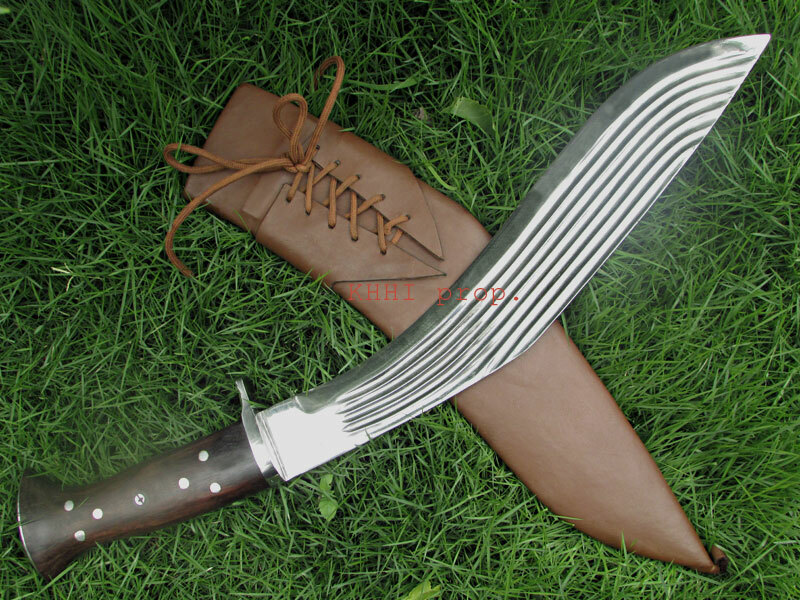 HANDLE: Full flat tang riveted wooden handle (Panawal) that is fully polished is fitted. Extra added feature is we have used barrel knots for extra strength and lifelong usage. Classic handle but plain with no ridges and rings is adopted for easier and better grip. GUARD: Vertical steel guard that stands about 1” tall is fitted at the top of the handle (between blade and handle). It is for hand protection to work as a barrier/stopper to keep fingers within handle section and not go any further beyond towards the sharp edge. It adds beauty and strength too. WEIGHT: Well balanced weight of just about 1175 gms is executed to bring stability and sustainability. 7 x chirras are fitted in much less room (width) comparatively to cut down weight and thus easy handling. 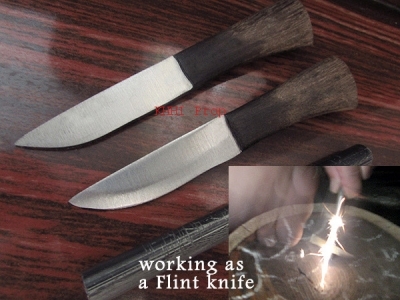 The provided weight is perfect for the knife as per its profile and its objective and is also easy on the user. 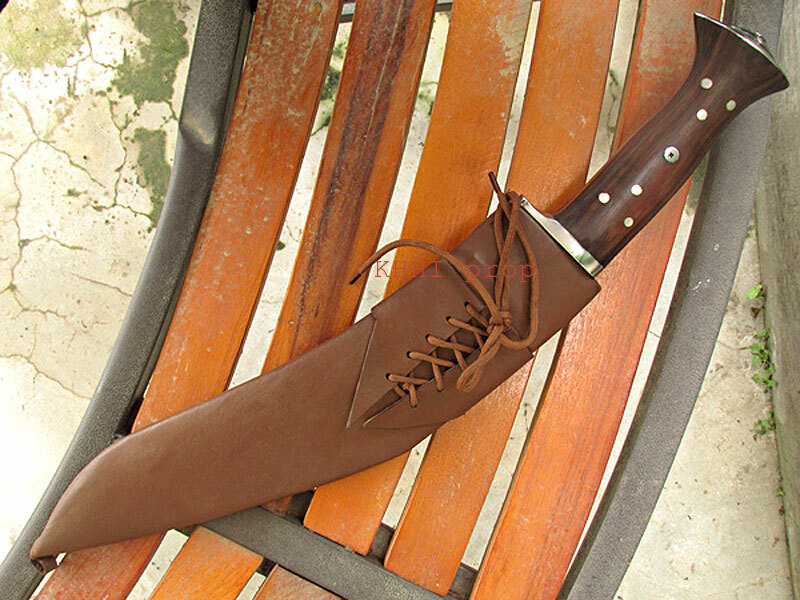 SHEATH: Light brown leather sheath is used to match with its wooden handle. 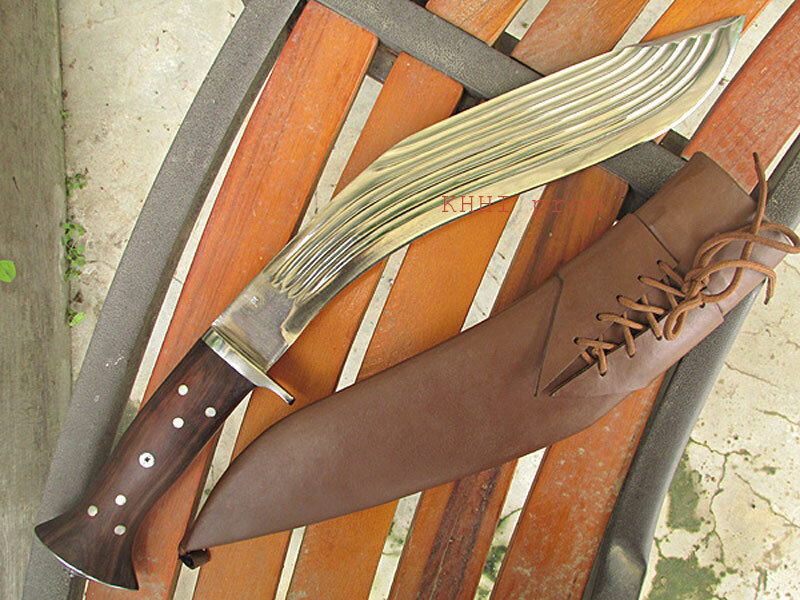 The imported treated leather sheath gives a stunning look to the khukuri. Its unique frog is another beauty. A differently shaped “V” cut frog with lace fastening system is adopted. The frog has an attached belt loop at the back for the belt to go thru and keeps the knife closely attached to the body. Carriage is much easier and more comfortable to operate the blade. Lanyard loop is fitted in the tip to facilitate a leather cord to go thru to tie around thigh for easier and better mobility.